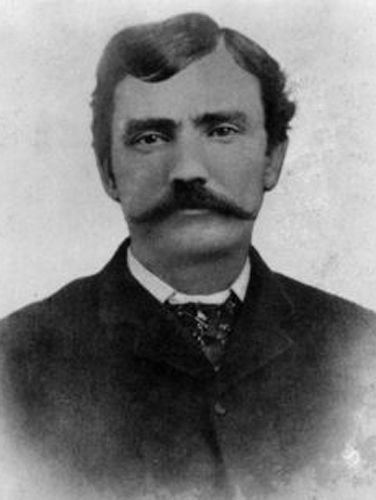 John King Fisher (1854-1884) – Born northeast of Dallas, Texas, the family moved north of Austin around 1960. When Fisher borrowed a horse without telling the owner, he was soon arrested for horse theft. He soon escaped from the posse with the help of the horse’s owner, who decided not to press charges. He then made his way to Goliad, Texas where he was soon arrested for breaking into a house. He was sent to prison but pardoned just four months later. Moving on to Dimmit County, he established a ranch in an area where cattle rustling was rampant. Before long, Fisher was right in the middle of it, with his ranch serving as a haven for drifters and outlaws. He was sometimes known to ride with Mexican rustlers, sometimes making off with as many as 100 head of cattle. His outlaw activities often led to violence and he quickly gained a reputation as a skilled gunfighter. He was arrested at various times by Texas Rangers Leander McNelly and Lee Hall but always managed to avoid conviction. Evidently, by 1876, Fisher had his fill of the outlaw life, married and bought a ranch near Eagle Pass. In 1881 he was appointed deputy sheriff of Uvalde County and two years later became the sheriff. He turned out to be an efficient and popular lawman and made plans to run for re-election in 1884. However, on the night of March 11, 1884, in the Vaudeville Variety Theater in San Antonio, Fisher, and his companion, noted gunman Ben Thompson, were involved in a shootout brought on by a quarrel between Thompson and the theater’s owners. Both Fisher and Thompson were killed. By Kathy Weiser-Alexander, August 2017.